The American Nightmare, a documentary directed by Adam Simon, examines the nature of 1960's-70's horror films, the involved artists, and how they reflected contemporary society. The film features interviews with John Carpenter, Wes Craven, David Cronenberg, Tobe Hooper, John Landis, George A. Romero, and Tom Savini, among others. 1924 – - John Herbert Frid (portrayed Barnabas Collins in Dark Shadows) born. 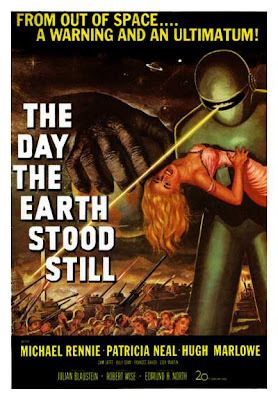 Tonight's feature is the classic sci-fi film The Day the Earth Stood Still, starring Michael Rennie as Klaatu. This year, it's not the turkey being carved for Thanksgiving. Happy Thanksgiving! 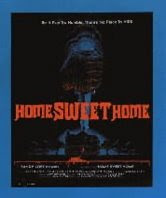 Not a lot of horror movies take place on this holiday, but there is the 1981 slasher film Home Sweet Home. Here's a death scene clip collection from the movie, for those that have an ...ahem... appetite for this sort of thing. No need to give me thanks. A biker comes upon a girl with a flat tire and offers her a ride home. He winds up at a drug party with the girl's sister, then follows her to a turkey farm owned by her father, a mad scientist. The father turns the biker into a giant turkey monster who goes after drug dealers. 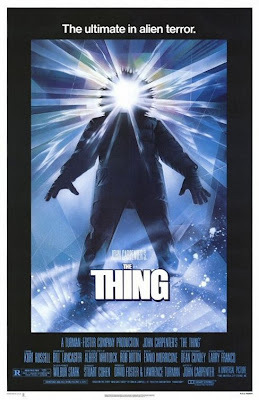 Tonight's feature is The Thing, directed by John Carpenter. Members of an American scientific research outpost in Antarctica find themselves battling a parasitic alien organism capable of perfectly imitating its victims. They soon discover that this task will be harder than they thought, as they don't know which members of the team have already been assimilated and their paranoia threatens to tear them apart. This is a chilling remake of The Thing From Another World, a 1952 movie which featured James Arness (of "Gunsmoke" fame) in the role of The Thing. The movie Twilight opens today, so it seems appropriate to post a painting of dark romance. 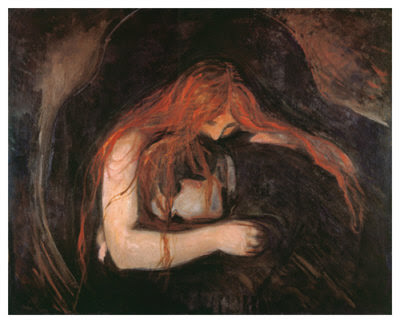 "Vampire" was painted in 1893-4 by Edvard Munch, whose works also include "The Scream". In honor of this occasion, here's the toilet scene from the 1987 movie Ghoulies II. Tonight's feature is Children of the Corn, based on a story by Stephen King and starring Linda Hamilton. A young couple wander into a mid-western town where all the adults are apparently dead and the children participate in a cult that worships a malevolent force in the corn fields. 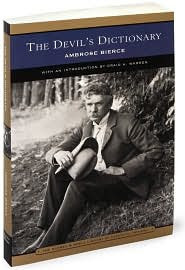 The Devil's Dictionary, by Ambrose Bierce, is a satirical book published in 1911. It offers reinterpretations of terms in the English language which lampoon cant and political double-talk. Here's a scene from Day of the Dead (1985) with my favorite zombie, Bub. This final chapter of George A. Romero's "Dead Trilogy" is even gorier than the first two "Dead" films - Night of the Living Dead (1968) and Dawn of the Dead (1978) - thanks to special makeup effects by gore master Tom Savini. The blood and entrails used in the disemboweling of Capt. Rhodes were real. Pig intestines and blood were procured form a nearby slaughterhouse and used to make the scene. During filming the refrigerator housing intestines and blood was unplugged by custodial staff, and the entrails started to spoil causing most of those involved to become physically sick. Here's an Internet Yellow Band trailer for the The Unborn, which opens in theaters January 9. You can find out more at the official movie site. Here's a movie that kept me riveted to the screen when I saw it on television as a kid in the 60's. 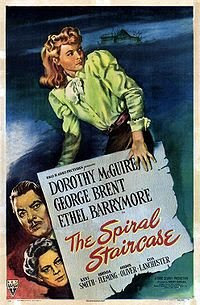 The Spiral Staircase, directed by Robert Siodmak, is a psychological thriller. Based on Ethel Lina White's novel Some Must Watch, in which the heroine was crippled rather than mute, the novel was adapted for a radio production starring Helen Hayes before reaching the screen. Her performance in the movie earned Ethel Barrymore an Oscar nomination in 1947 for Best Actress in a Supporting Role. Beautiful young mute Helen is a domestic worker for old ailing Mrs. Warren. Mrs. Warren's two sons, Albert (a professor) and womanizing impudent Steven, also live in the Warren mansion. Mrs. Warren becomes concerned for Helen's safety when a rash of murders involving 'women with afflictions' hits the neighborhood. She implores her physician, Dr. Parry, to take Helen away for her own safety. When another murder occurs inside the Warren mansion, it becomes obvious that Helen is in danger. A man stood upon a railroad bridge in northern Alabama, looking down into the swift water twenty feet below. The man's hands were behind his back, the wrists bound with a cord. A rope closely encircled his neck. It was attached to a stout cross-timber above his head and the slack fell to the level of his knees. "An Occurrence at Owl Creek Bridge" is a short story by Ambrose Bierce. It was originally published in 1890, and first anthologized in Bierce's 1891 collection, Tales of Soldiers and Civilians. The story is famous for its irregular time sequence and twist ending. A 1962 French short film was based on this story. It was directed by Robert Enrico and produced by Marcel Ichac and Paul de Roubaix with music by Henri Lanoe. It won awards at the Cannes Film Festival and the Academy Awards, and was also screened on American television as an episode of The Twilight Zone. Tonight's feature is an American cult classic comedy horror film - The Toxic Avenger. Released by Troma Entertainment, known for producing low budget B-movies with campy concepts, and virtually ignored upon its first release, The Toxic Avenger caught on with moviegoers after a long and successful midnight movie engagement at the famed Bleecker Street Cinemas in New York City in late 1985. Happy Election Day! In keeping with the theme of this site, yet wishing to note the day, here - straight from the White House website - are Ghosts of the White House! Halloween is over (sigh), but here's a little pre-Christmastime tale for you. Listen to "Back for Christmas". The story was also produced as an episode of Alfred Hitchcock Presents in 1956. You can watch the full episode in a popout window by clicking on the picture below. 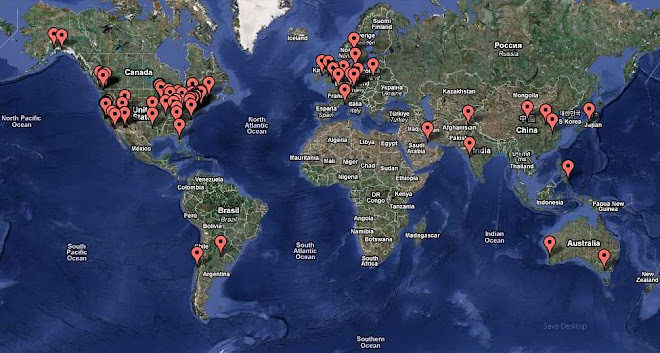 Source for radio broadcast: Escape and Suspense! Welcome to tonight's episode of Friday Night Frights. Yes, it is Saturday, but the Halloween spirit(s) lingers. Tonight's episode, The Midnight Meat Train, is a FEARnet Special Presentation. From Clive Barker comes the story of a man struggling to make it as a photographer. Today's assignment: Follow that guy into the NYC Subway. And by the way, he is a serial killer. Starring Bradley Cooper, Brooke Shields, Leslie Bibb, and Vinnie Jones. Playing on the side of the house were Mad Monster Party (1969) and Abbott and Costello Meet Frankenstein (1948).